I thought Lilly was out of the stroller phase of life until I wanted to walk somewhere like two blocks in less than an hour. I started to search out the double stroller for our family. I thought about a side by side but they looked cumbersome when I saw mom's use them. I thought lets go with a Graco since our car seats, pack n play and other stroller are Graco's. It seems natural until you see how huge it is. Ryan thought it was too wide to get through store doorways. This isn't mine but it just looks huge. Then a friend gave me a Sit n Stand. Thank you so much for the experience Lilly is still little and I wanted her to be able to sleep so it really doesn't work well. Also I have tendinitis and it was hard to steer. I even tried out new ones and had the same problem. I wanted to do a lot of walking in the neighborhood and there was no sun shade for Lilly either. It didn't have the ability to put Jonathan's car seat in it - I would need to buy an attachment. I really didn't love it so I passed it on to a foster mom with two little bigger kids who needed it more than me.. I imagined Anna would want to be in it too. Isn't this every mom's fear? I had another mom friend who was cleaning out her garage. She had a double for me to try. I saw it and gave her a puzzled look. She put it together and I got to tinker. I washed it down the one nice day we had in April. I started to use my husbands air compressor to blow up the tires. Oops it was set at 120 psi and the tires take 20 psi, I thought I adjusted it right. The tire went boom and I went to Target to get a new tube. Then I read the instructions on this Phil & Ted Sport. I never heard of the company and would not have found it in Iowa. The back part has Lilly in it and is removable. It isn't much bigger than just Jonathan in my Graco 1 person stroller. The beauty is Jonathan can be in the back if he isn't in his car seat. People are surprised to see the other kid in there. 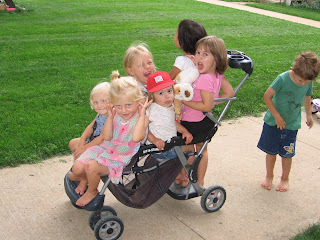 I just make sure the heaviest kid is in the front or the stroller tips. Lilly can hop out of either part. I am enjoying it. It works well for my work out class doing squats up hill. I helped a friend recycle and didn't have to pay full price. Thank you ladies for the advice. Now I can walk the world with my kids or at least the mall.